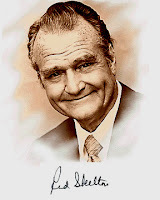 ﻿﻿Perhaps one of the most memorable moments in television history was on January 14, 1969, when legendary comic, Red Skelton, became suddenly serious at the end of one of his television show as he reminisced about an incident from his childhood. Something was on Red's mind he wanted to share. You have to remember that this was during the Vietnam War when anti-war protests had rendered the American flag as much as symbol of divisiveness as that of unity. It was also a time when the Supreme Court ruling eliminating prayer from schools was still fresh in the minds of Americans. Red said what he had to say in his own way. He remembered back to his boyhood, when his teacher, Mr. Lasswell, felt his students had begun to recite the Pledge of Allegiance as if it were a daily drudgery. He decided to take a moment, and recite it to them, telling them the meaning of each word. Ever since the first broadcast, Red Skelton's words have remained a perennial favorite--especially around patriotic holidays. I -- Me; an individual; a committee of one. Pledge -- Dedicate all of my worldly good to give without self-pity. of the United -- That means we have all come together. States -- Individual communities that have united into 48 great states; 48 individual communities with pride and dignity and purpose; all divided by imaginary boundaries, yet united to a common cause, and that’s love of country, of America. And to the Republic -- A Republic: a sovereign state in which power is invested into the representatives chosen by the people to govern; and the government is the people; and it's from the people to the leaders, not from the leaders to the people. For which it stands, one nation -- Meaning "so blessed by God." With Liberty -- Which is freedom; the right of power for one to live his own life without fears, threats, or any sort of retaliation. And Justice -- The principle and qualities of dealing fairly with others. For All -- For All. That means, boys and girls, it's as much your country as it is mine. "I pledge allegiance to the Flag of the United States of America, and to the Republic, for which it stands; one nation, indivisible, with liberty and justice for all." Since I was a small boy, two states have been added to our country, and two words have been added to the Pledge of Allegiance: Under God. Wouldn't it be a pity if someone said, "That is a prayer" -- and that be eliminated from our schools, too? Red Skelton couldn't have been more right about that . . . that's exactly what's been happening with The Pledge of Allegiance in the years since. It's been under attack. In the end, it will be up to Americans to decide the fate of the Pledge of Allegiance in school. But there is one place where its future isn't in doubt--within the walls of Masonic Lodges across the United States, where it is recited before the opening of every meeting. "Since I was a small boy, two states have been added to our country, and two words have been added to the Pledge of Allegiance: Under God. Wouldn't it be a pity if someone said, "That is a prayer" -- and that be eliminated from our schools, too? [sic]"
The separation of church and state is a principle that has long been a part of Masonic thought. In particular, the Ancient Accepted Scottish Rite (SMJ) has, historically at least, been quite vocal in their support of it. The addendum to the Pledge to which Skelton refers was added in 1954 as an exercise in McCarthyism. More in the nature of a "gotcha" to "godless Communism" than any declaration of either love of country or the Almighty, when one considers the politics of the time. Brother Bellamy opposed ANY changes to the Pledge, and was quite outspoken on the manner. It's worth considering what might have happened had he been alive in 1954- at the ripe old age of 99. His opposition to any changes in the Pledge, compounded by his own status as a Christian Socialist would have, no doubt, had Joe McCarthy, his Senate committee, and HUAC in tailspins. Oh.. one more point: the Pledge is not said in every regular Masonic jurisdiction in the United States. Depending upon the particular Grand Lodge, it can be required, recited at the wish of the Worshipful Master, or actually prohibited.